Discussion in 'Recruiting Archive' started by Jared Grubbs, Feb 19, 2016. 2017 Cushing Academy (MA) PG Wabissa Bede (@Wabissa_B11) picks up an offer from VCU. I've only seen a few highlights of Bede but he reminds me of a bigger Nic Moore. Just a first impression. WVU, Virginia, Villanova, Tennesee & DePaul have reached out to '17 Mass Rivals PG Wabissa Bede. VCU & Temple offered him in the winter. Stiff comp for 2017 PG Wabissa Bede. Terry Johnson follows him on twitter. Bede is really good. Providence has been on him for a long time. 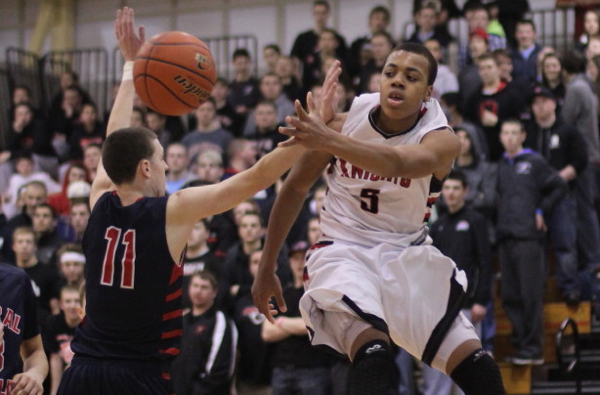 Butler offered 2017 Wabissa Bede tonight. Rivals Nation PG. Bede - super quick and crafty with the ball in his hands. But can he play within a team-oriented system? He did a bit too much "look at me" in that video. Alex - hate to say this bc the kid is a giant tool, but watching his video reminded me so much of JP Macura. Similar size, similar athleticism, similar skills going to the hole and shooting from outside. Even kind of look the same. Macura is 6-5 and Oconnell is 6-6...did you think he meant bede and Oconnell were the same size? Schragge (this guy really needs a nickname/abbreviation) unemployed, not out recruiting? This was the assignments during the 2 week, Spring recruiting period? And we don't offer a single HS kid until the end of May? And the first(?) kid we do offer is an Adidas kid? Lewis is gone... I realize Schragge scouted him before at Stanford, but were there no other prospects that anyone on our staff saw that were offer worthy? Idk whether to be more intrigued or upset? No no. Those two... Their games are nothing alike. Bede and Myles Fox Morrisey. Foxy and McConnell seem like clones. Bede said Butler's one of the schools recruiting him the hardest. Others are UMass, Temple, Rhode Island and LaSalle. That list looks beatable. I wonder if we'll play it slow in terms of actually going for a commitment. Bede is a nice player but I'd bet he's behind Barcello and Batts in the pecking order for the PG spot. If we are really recruiting him among the hardest, I'm not sure how we can do that and at the same time slow play a commitment. I think the staff really wants him. they're seeing something in him most aren't, I suppose, because of the many, many point guards we've been tied to in one way or another, he is the one generating the lowest level of excitement (including for me). I'm sure they want him, but would picking him up preclude us from still recruiting above him for someone like Batts? Having two PG options doesn't seem crazy.